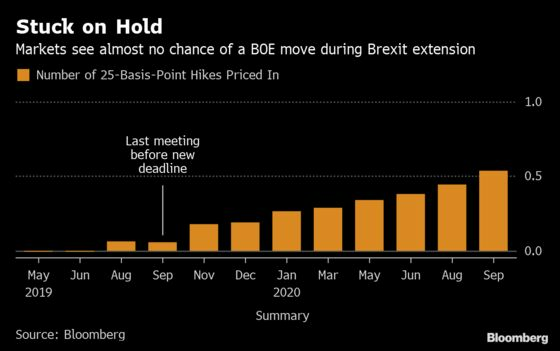 (Bloomberg) -- The U.K.’s Brexit extension looks set to keep the Bank of England stuck on pause for many months to come. The six-month addition is unlikely to give officials a large enough window to be able to consider hiking rates, according to economists and investors. The delay is seen as too short to lift the uncertainty for businesses and consumers, and will likely allow cautious BOE policy makers, who have previously said they would wait and see how Brexit evolves before acting, to continue to sit on their hands. That view is reflected in markets, which see only a 6 percent chance of an interest-rate hike before the new Oct. 31 deadline, and an 18 percent probability of a move by the end of the year. Meanwhile, Bloomberg economist Dan Hanson says it’s now unlikely the BOE will be able to increase before Governor Mark Carney leaves in January 2020. Speaking in Washington yesterday, Carney, who has extended his tenure at the central bank twice already, said the delayed Brexit date would not affect his plans to step down this time. He also said that the extension has eased some of his concerns about a no-deal departure, even if it ends up happening. While Carney didn’t comment directly on rates, previous comments from BOE officials suggest they are unlikely to make a move before Brexit is resolved. In February, Carney himself highlighted that the economy was suffering amid the “fog of Brexit,” as the bank downgraded its view on growth for this year and next. In March, Michael Saunders, considered one of the most hawkish members of the Monetary Policy Committee, said there’s no rush to raise rates until the uncertainty lifts. His colleague Silvana Tenreyro also signaled she wouldn’t be prepared to vote for a hike until she can judge the impact of any Brexit outcome. Their caution may be increased by a slower global growth picture, which has already prompted their counterparts in Europe and the U.S. to take a more dovish turn. The one potential caveat remains a continued pickup in wage growth in the U.K., which had been the focus of some officials before the latest bout of Brexit upheaval. However, with the nation’s headline inflation rate below the BOE’s 2 percent target, there’s little immediate pressure to act. “With the headwinds facing the U.K. economy set to remain in place, the chances of a rate hike from the Bank of England this year have faded considerably,” said ING Groep NV strategist Petr Krpata. Still, while officials can afford stand pat for now, they will have one decision to make at their May meeting. With their economic forecasts previously based on the premise of a smooth exit in March, policy makers will have to update their assumptions, although it’s likely they will just push back their expectations for an orderly departure.